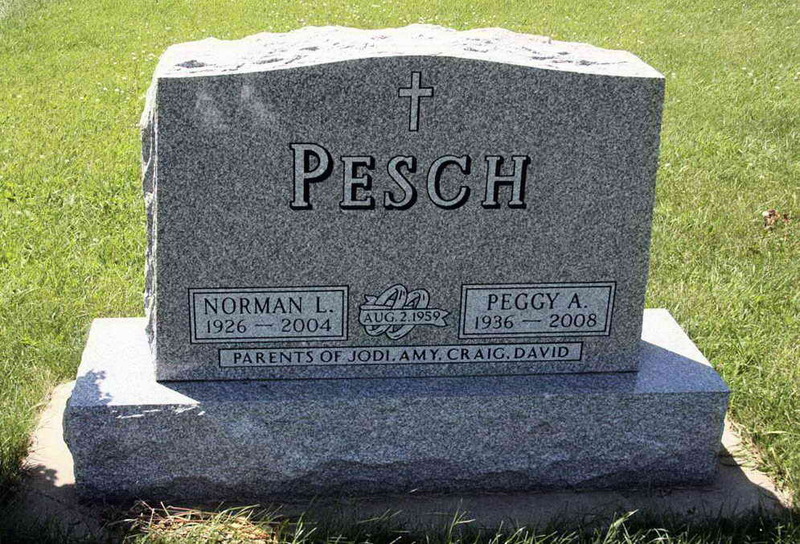 Front and rear views of the grave marker of Norman L. Pesch in the Trinity Lutheran Cemetery, Waltham (Mower County), Minnesota. Norman Laurel Pesch, 78, of Waltham, died Thursday, Dec. 30, 2004, in Austin. 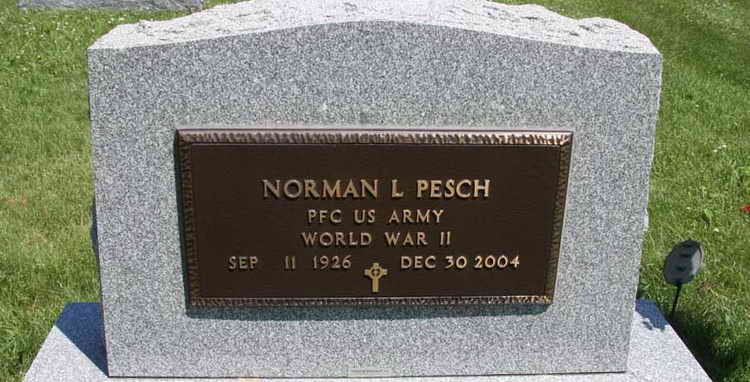 He was born Sept. 11, 1926, in Austin, to William and Dora (Reinke) Pesch. He married Peggy Persinger on Aug. 2, 1959, at St. Michaels Lutheran Church, Waltham. Norman was a life long resident of Waltham. He attended Trinity Lutheran School and later entered in the U.S. Army as a paratrooper during World War II. After serving in the military he worked as a bulk tank driver for Mower County Service in Sargeant, Minn., for many years until his retirement in 1986. He was a member of Trinity Lutheran Church, Waltham, and a member of the American Legion in Hayfield. Norman enjoyed camping, fishing, bowling and watching sports. He is survived by his wife, Peggy, Waltham; children: Jodi (Kelly) Fitzgerald, Sargeant; Amy (Ray) Jacobson, Stewartville; Craig (Debra) Pesch, Hayfield; David (Candace) Pesch, France; siblings: Florence (Mort) Blinderman, St. Paul, Minn.; Glenn (Alice) Pesch, Hayfield; Dorothy (Howard) Thole, St. Paul; Clarence Pesch, Waltham; Delores Hahold, Vadnais Heights, Minn.; Gilbert (Phyllis) Pesch, Lee's Summit, Mont. ; and James (Marcia) Pesch, Waltham; 10 grandchildren; and two great grandchildren. Visitation: 4-8 p.m. today at the Czaplewski Family Funeral Home, Hayfield, and one hour prior to services at the church Monday. Service: 10:30 a.m. Monday, Jan. 3, 2005, at Trinity Lutheran Church, Waltham, with the Rev. Jeffrey Kuddes officiating. Interment: Church Cemetery with military honors provided by the Hayfield American Legion Post 330. Funeral Home: Czaplewski Family Funeral Home, Hayfield. Memorials: Trinity Lutheran Church.